You are here: Home > Blog > Flora & Fauna > Woodland ants. Ants, like bees, belong to the Hymenoptera (insects with membranous wings and narrow ‘waists’). Like the bees, ants are ‘social insects’ and within their colonies / nests, there is a division of labour (workers, soldiers, queens). In the U.K, there are a number of ant species but Britain’s ant population is probably smaller than the ant populations in warmer European countries. 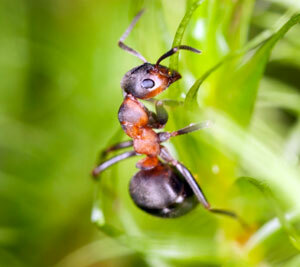 There are four main species of true wood ant - Formica rufa, F. aquilonia, F. lugubris and F. pratensis. rufa is the southern wood (or horse) ant – it is a sun-loving species, liking open glades and the edges of woodlands – particular in coniferous woodland. The ants are quite large – workers being about 10 mm ( 1cm) in length and the queens about 12 mm. pratensis is the European red ant. This is similar to F. rufa but darker in colour, and likes warmth. Its nests are smaller (often made of grass and small twigs), it is thought to be ‘extinct’ on mainland Britain. lugubris or hairy wood ant (or northern ant). This can be found in Scotland, northern England and parts of Wales – in mixed or coniferous woodland. It tends to favour young woods, glades, rides and woodland edges. aquilonia or Scottish wood ant. 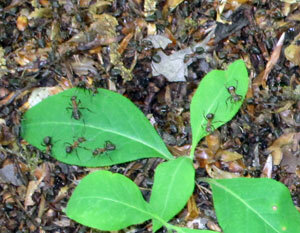 This is similar to the above ant (both hairy) but it can tolerate the shade of dense woodland stands. Other ant species may be found in woodlands, for example, Formica exsecta (Narrow-headed ant), Formica rufibarbis (Red-barbed ant) plus the erratic ant (Tapinoma erraticum) amongst others. 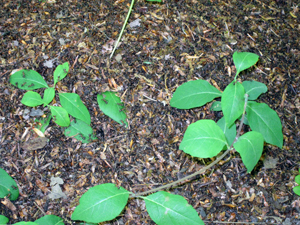 Ants have a number of roles within the woodland ecosystem. For example, they assist in the distribution of certain seeds. Ants are particular associated with honeydew-producing insects, notably aphids. Honeydew is a sugar-rich liquid, exuded from the abdomen of aphids (greenfly / blackfly belonging to the Order - Hemiptera). Honeydew is collected by ants directly from the aphids; hence the trails to the favoured trees where the aphids are feeding on the leaves. It is thought that the aphids benefit from this association as the ants’ presence deters predators and parasitic wasps. Through the building of nests, they affect the soil profile, the drainage and permeability of the top soil, and help with the distribution of various nutrients. Their nests offer a ‘home’ to various beetles and to one particular species of woodlouse that has ‘lost’ its eyes and colour (Platyarthrus hoffmannseggii), having completely adapted to living in the dark recesses of the nests. The southern wood ant builds large, ‘thatched’ nests, which may contain many thousands of workers and queens (up to a quarter of a million). Whilst the heart of the nest is deep underground, on the surface there is a soil core surrounded by a ‘thatch’ of materials. 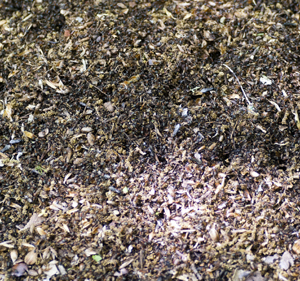 The ants use a variety of materials in the thatch – small twigs, moss, heather, pine needles’ these materials are carefully positioned so that they not only intercept the sun’s rays (to help warm the nest) but also are laid in such a way that water / rain runs away from the nest (reducing the risk of flooding). Other species build their nests in gravel or sandy / stony soils or make use of rotting tree stumps. A wood ant colony / nest can persist for many years and survives so long as there is a queen (s) present. During the winter months, only queens and a limited number of the workers live on deep inside the nest (using reserves of fat deposited earlier in the year). Once the temperature begins to rise in the Spring, then workers will begin to emerge and start to forage – then the queen(s) will begin to start laying eggs again. Fertilised eggs will give rise to female ants, and unfertilized eggs give rise to males. Males and queens have wings, and are also bigger than the workers. The life expectancy of a worker averages about 60 days. There are some 1200+ species of ant world wide, and the biomass of ants is probably the same as the total weight of humans across the Earth. Ants are strong – in relation to their size, being able to lift and carry things many times their own mass. Again, in relation to their size, they can move as fast a racehorse. Ants use sight and smell to navigate. They make use of pheromones (volatile chemicals) to lay paths for others. The study of ant trails / behaviour has inspired computer programs / simulations to the “travelling salesman problem” - finding the shortest route round a large number of fixed locations, also vehicle routing and pick up problems. Ants can spray formic acid from their abdomen up into the air – when threatened. This smells like vinegar and is thought to be a deterrent to birds / other predators – from doing serious damage to the nest (and its inhabitants). Ants have been around for a long time – 130 million years. Various types of ant have been found in fossilized resin – amber.